The DGC team has been on the ground for two full days – attending sessions, exploring all the brand activations and trying to soak up all the crazy, serendipitous moments that SXSW has to offer. Across everything that we’ve been experiencing, it seems like there are two resounding themes to this year’s festival: Virtual Reality and puppies. VR is here to stay, and will only get bigger and better. We sat in several sessions that touched on virtual reality in some kind of way. From how brands are currently using VR to engage consumers, to how media companies see it changing the content landscape in the next few years, it is very clear that VR is the new platform de jour. In one session we attended, North Face shared plans to integrate VR into their retail experience and expanded on how they think VR is creating a new visual language for marketers. And we couldn’t agree more as we got to experience different ways brands are using VR as an engagement tool first-hand. From the Samsung VR pedicab rides to the McDonalds VR Lounge – it seems like someone has a VR headset on around every corner. The other thing around every corner? Puppies! Mophie, the California-based maker of battery-charging smartphone cases enlisted six motorcyclists to drive around downtown Austin with an unconventional side car guest, a St. Bernard. If you happen to see one of these pups cruising around, you can socialize using #MophieRescue to win a free phone case. Off duty pups are also hanging out at Mophie’s festival headquarters, the “Bad to the Bone Bar” lounge. And if that’s not enough, at Gro’s Connected Yard exhibition on busy Rainey Street, puppies from Austin Pets Alive! were a cuddly addition to the mix of tech innovation. SXSW attendees could talk all things digital while petting and even getting the chance to adopt the cute little creatures. The SXSW Interactive (SXSWi) hype machine is in full effect as we inch closer to the event kick off this week (March 11-15) in Austin, Texas. From President Obama’s keynote to promises of robots everywhere, this year’s schedule has more to offer than ever before for all of you makers, creators and digital savants. Continued talk about politics: All eyes will be on Obama as he delivers the opening keynote. The President will participate in a live Q&A with the Texas Tribuneto talk about technology’s growing role in the political process. Considering we’re in the middle of a headline-worthy elections season, this will only be the beginning of the political talk swirling on the ground. I. and Robots, not as futuristic as we think. SXSWi will host the first ever Robot Ranch this year where attendees will have the chance to get up close and personal with A.I. animals. Attendees can get their hands on the different types of robots and chat with creators. Gamergate (the controversy continued): You may remember the controversy around SXSW last fall, when organizers pulled two Gamergate-related panels from the agenda citing “violent threats.” The festival was criticized for giving misogyny a platform and an Internet outcry abounded. Long story short, SXSW re-instated the sessions and added a day-long, live-streamed online harassment summit to discuss the topic. A big startup launch. Last year’s SXSWi saw the launch, and subsequent explosion, of live broadcasting app Meerkat — it was reminiscent of 2007, when Twitter blew up at SXSW, and 2009, when Foursquare accomplished the same feat. Who will attempt it this year? Check out the Startup Village and their signature competition, SXSW Accelerator. Following Obama’s session on Friday, we’ll be heading over to Austin City Limits to attend a session with 360i’s Chief Strategy Officer who will be talking about innovative brands using data-driven marketing. On Saturday, we’ll be kicking off the weekend at a session with Marie Claire who will be sitting down with the stars of Broad City to discuss the transition of their show from web series to cultural phenom. #yassqueen From there, we’ll be learning about how brands can join the billion-dollar idea club at a session with KITE, Coca-Cola and MasterCard. Later in the day, GSD&M will host a discussion on which risk-taking brands are successfully connecting with their customers via Periscope and Meerkat. We’ll have to divide and conquer on Sunday – the day kicks off with two great sessions at 11am – one with Facebook that will explore the power of A.I. and how it’s posed to shape our future. The other session is hosted by InStyle Magazine – the editor will sit down with Kerry Washington to discuss the “new rules” of stardom. Then, we’ll finish off the day by hosting a #DGCSundayFunday cocktail party at the W Hotel. On Monday, Ogilvy & Mather will be touching on the challenges of marketing to a Latino audience in a session about how they made the Modelo Especial story “special,” not schizophrenic. Before jumping on a flight home on Tuesday, we’ll be sure to catch one last session at the Austin Convention Center. SoulCycle founders will be sharing their story in a session entitled, “How to Create a Movement.” We’ll be taking notes in that one for sure! To keep abreast of these and other happenings on the ground, follow @DiGennaro and #DGCsxswi + our colleagues who will be in Austin: @SamDiGennaro, @erindonahue, @MarielenaSan, @perezOrourke and @sylvia_zhou,. We love music because it puts into words our thoughts and feelings in a way that we would want them to be said. Last night’s Grammy Awards celebrated the music and performers that create the soundtrack to our lives. Yet, between the stomps of Kendrick Lamar and the soulful stylings of Bonnie Raitt, it became clear that brands were at the top of their game last night – composing a number of notable advertising masterpieces. In our opinion, this year’s Grammy’s advertisers were remarkably more creative than what we saw during the Super Bowl. Here’s three we thought tapped into the Grammy’s spirit. Lady Gaga as the ultimate chameleon, David Bowie, was pure gold. So too was connecting her with tech giant Intel for pre and post-performance spots. Taking us behind the scenes of Gaga’s spectacular performance demonstrated the integral role Intel plays for brand innovation in the music space. Just imagine what Intel could do for you! If a premium is placed on knowing your audience then Truth.org should receive an award for their #CATmagedeon spot. With teen smoking on the rise, Truth eschewed the traditional scared straight approach to health warnings. Taking aim at the unique relationship between people and their pets, Truth combined cute with poignant to deliver a strong message that is sure to resonate on social media. Gwen Stefani and Target had audiences guessing: Is it an ad or a video? The live four-minute, seven costume change performance – replete with roller skates – left audiences breathless and gave Target a few cool points. Great music just doesn’t happen, it’s the culmination of talent, experience and courage. The same for great advertising. Our big winners sought to tap into the power of the 25 million Grammy viewers – the most for any entertainment show this year. The brands each understood who viewers of the Grammy’s are and what’s important to them. So, will ads during the Grammy’s and the Academy Awards begin to rival the Super Bowl? If brands become as courageous as musicians like Lady Gaga then the answer is, yes. The Super Bowl is about stories: the big catch that wins the game, the goal line stand that stops a crucial touchdown, the thrilling (and sometime shocking) half time performances. This is what marketers do every day. Little wonder, then, that the Super Bowl has become as much about the advertising as it is about the game…walking hand-in-hand to create to create sports narratives and iconic commercials that will be talked about for years to come. And so on Sunday night, while an ambitious young quarterback battled a veteran looking to write a final chapter to a celebrated career, 80 ads were seen by 115 million viewers around the world. Cuteness, Canines and Ketchup: If you’re an animal lover you weren’t disappointed – there was an endless parade of animals throughout the game. The Clydesdales made an appearance for Budweiser, as did a stampede of wiener dogs reunited with their ketchup bottles for Heinz, a flock of sheep sang the lyrics to “Somebody to Love” and one of the most buzzed about creatures: the “puppymonkeybaby” – a diaper clad baby bottom, monkey torso, dog head for a Mountain Dew spot. Celeb-ration: From Alec Baldwin, Steve Harvey, to Amy Schumer and Seth Rogen, there was an onslaught of famous faces during the commercials. Take this highly-praised spot for Avocados From Mexico, created by Austin-based creative agency GSD&M, which featured “Happy Days” actor, Scott Baio. Another fun spot featured celebrity recording artist Janelle Monae paying homage to iconic songs in this pre-half time show spot for Pepsi. Autos in the driver’s seat: It’s no surprise to see car ads during the Super Bowl, but brands like Hyundai and Prius captured the audience’s attention and sent a buzz through social media. Christopher Walken also made an appearance for Kia in this ad from creative agency, David & Goliath. New Advertisers Taking the Plunge: As you’d expect, the Super Bowl featured many established brands, Budweiser, Doritos alongside big-name soda brands. What surprised us this year were the first-time brands who paid big dollars to get in front of a huge, captive audience, especially tech brands. From PayPal to SoFi (an online lending start up), to Bai, Amazon, LG Electronics SunTrust Banks and even pharma companies there were many first-timers who entered the game. We also noted that while the Super Bowl ads certainly entertained, the more lofty commercials that look at the human condition were in short supply. We’ve come to expect these kinds of cinematic and inspirational ads from brands such as Coca-Cola. Instead, the brand ran a commercial featuring the Incredible Hulk and Ant-Man arguing over a ‘mini’ can of soda. A far cry from the rousing ads and motivating messages they’ve typically delivered. Perhaps one of the most intriguing marketing moments of Super Bowl 50 was not scripted by any adverting agency. When asked what the future held, Peyton Manning replied he was looking forward to drinking, “a lot of Budweiser.” The twice repeated reference was PR gold; a hero’s endorsement in the golden moment. Today, Madison Avenue, much like the Carolina Panthers and Denver Broncos, will take a collective step back to debate what worked and what didn’t. They’ll go over every move along their journey to discern the right moves from the wrong ones. If there’s one theme they all share – it’s that they went big and gave it their all. Stay tuned…the story continues next year. Welcoming new talent is an exciting opportunity for any agency. They bring fresh ideas, new perspectives and varied expertise that adds to a team’s collective skills. Every now and then though, agencies have the opportunity to welcome new talent that also knows the inner-workings of the agency. Here at DGC we love when this happens. Over the course of our ten-year history, we’ve had the pleasure of welcoming back employees who took advantage of new opportunities to spread their wings and fly. We’ve found that these boomerangs come back with more unique insights and a fresher perspective and a host of new approaches to PR and strategic communications. Of course, because they know the inner workings of DGC, they also transition more easily into new roles with new team members, while understanding how their “new assets” can complement the entire organization. This past month, we have had the chance to welcome two boomerangs back to DGC: Chrissy Perez-O’Rourke and Claire Eisenberg (who rejoined from Big Spaceship and 360i, respectively). Here’s what they had to say about coming back to DGC. Creative work that drove results. Double-digit revenue growth. Throwing open the doors to reinvention. That was the formula that propelled ten agencies to the heights of this year’s Advertising Age A-List. In looking at the winner’s circle, we analyzed some of the traits that helped comprise the winners who are shaking us out of comfort zones and reshaping the advertising industry. Blazing the way was Droga5, winning both Ad Age’s and Creativity’s Agency of the Year award. Described by Ad Age as “restless”, Droga5 found ways to extend the reach of dynamic brands like Under Armour and Google, as well more conventional ones like insurance giant, Prudential and toilet paper manufacturer, Great Northern. The marketplace embraced Droga’s creativity as seen by several new client wins which contributed to a jump in revenue growth from $78 million in 2014 to $126 million. Double-digit growth was a factor common to all members of the A-List ranging from a low end of 10 percent (McCann/VML) to a high of 62 percent (Droga). A-Listers were able to ratchet up their growth through organic, as well high profile client wins. The ability to inspire new and innovative ideas was also on display in this year’s round-up. In 2015, Los Angeles based 72andSunny expanded its in-house incubator, 72U, while launching Brand Citizenship, an offering that connects​ ​with consumers on a cause to build brand love. R/GA partnered with Owlet, a product of its own “accelerator program,” to develop a sock that monitors infant’s vital signs. Already it has been attributed with saving three lives. These are tremendous ideas that serve as industry benchmarks. Beyond the A-List, was another group of agencies that are solving client challenges and are poised to take a shot at top slots in the future. WPP creative shop Ogilvy & Mather was recognized as an Agency Stand Out for landing a piece of Coca-Cola’s media business coming out of one of this year’s biggest media reviews – further evidence that big, bold ideas and pushing the boundaries always prevail . Daring to take a fearless and ambitious approach to marketing contributed to The Community’s Multicultural Agency of the Year recognition. Their work for brands such as, Corona Extra and Modelo Especial, were so well-received that they’ve now moved into the mainstream market. While the DGC team is very familiar with the submission process and the standard form agencies fill out is imperative, the process truly begins at early on each year. All of the winners in this issue, and in the past, had been eyeing Ad Age’s A-List as soon as the prior year’s results were published. It is no easy feat – a huge effort that demands excellence from all aspects and areas of agency business: creative, strategy and finance. Fostering relationships, sharing news, ideas and agency developments with Ad Age throughout the year (both on and off the record) will keep you on their radar and put you in prime position for the 2017 A-List submission. Congratulations to all of the winners, we’re especially delighted and proud that so many of our clients are on the list…you know who you are! Congrats to Our Amazing #TeamDGC! DGC is all about celebrating our employees, especially the ones who continue to knock it out of the park time and time again! 2015 was a great year for our agency and we’re proud to celebrate and recognize several individuals for outstanding work over the course of the year. Our 2015 MVP honorees were Sara Ajemian, Bridget Bulters and Lexi Hewitt, who were all recognized for being exceptional in every sense of the word, day in and day out. Our latest Hall of Fame inductee, Kristen Bryan, has been with DGC since the start of the agency and joins Kendra Peavy and Erin Donahue Tice in the DGC Hall of Fame, a special placefor the best of the best and the consistently excellent. Congratulations to all of our awesome employees and here’s to another great year in 2016! As many of you may know, Cindy Gallop, the founder and former chair of Bartle Bogle Hegarty and founder of IfWeRanTheWorld and MakeLoveNotPorn, was invited to speak at an event earlier this week hosted by WPP shopper marketing agency, Geometry Global. The agency’s Executive Creative Director, Heidi Schoeneck, led the talk, which centered on promoting gender-equality in the industry. In case it is news to anyone, Cindy likes to call herself the “Michael Bay of business” for a reason, and a good one at that. Cindy is known for providing powerful words of wisdom and provocative points of view that truly inspire a larger discussion among her audience. This was true of the crowd in the theater at Geometry. The audience was on the edge of their seats with eyes wide open, and hands were high when it came time for questions. Thanks to Cindy, we found some inspiration as well and we can’t wait to take these insights and apply them to our careers and our daily lives. Therefore, we wanted to share a little Thursday wisdom to take you through the rest of your week and into the weekend so you can #BlowShitUp (the hashtag for the event). Change happens from the bottom up, not the top down.It is micro-actions – small, baby steps – that bring the biggest amount of change. Say what you think. That is your value.Saying what you think is the biggest micro-action that you can take for success in business. Never be afraid to speak up, even if you are the most junior person in the room. Telling the truth is so endearing because so few people do. Be your own filter.If people respond poorly to how you feel and how you express yourself, then they’re not for you. Don’t give a damn. Fear of what other people think is the most paralyzing fear in business and in life. It’s important not to pay attention to what other people think of you. Your own sense of value is all that matters. Take a long hard look at yourself and identify what you believe in and what you value. That’s the key to work happiness–not what other people think of you. 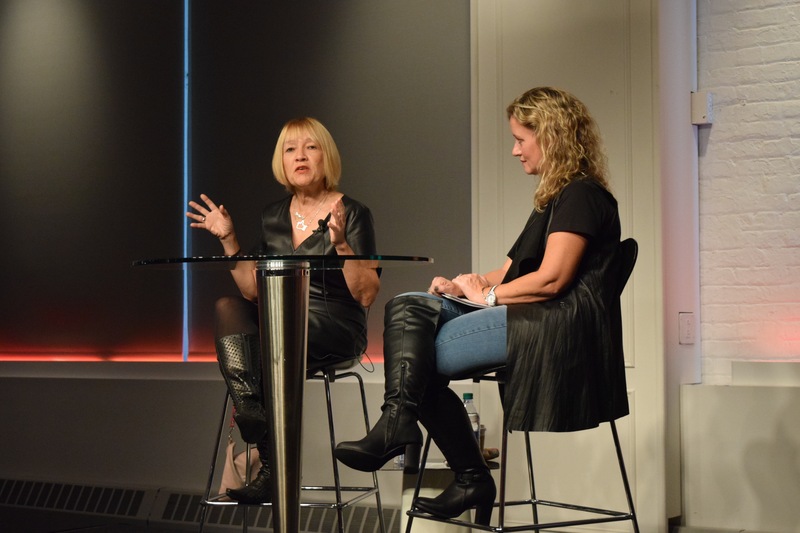 For some more fun thoughts, interesting sound bites and/or photos from the talk, search #BlowingShitUp and follow @CindyGallop and @heidischoeneck on Twitter. We’ll soon be preparing for next year, but until then…adios! 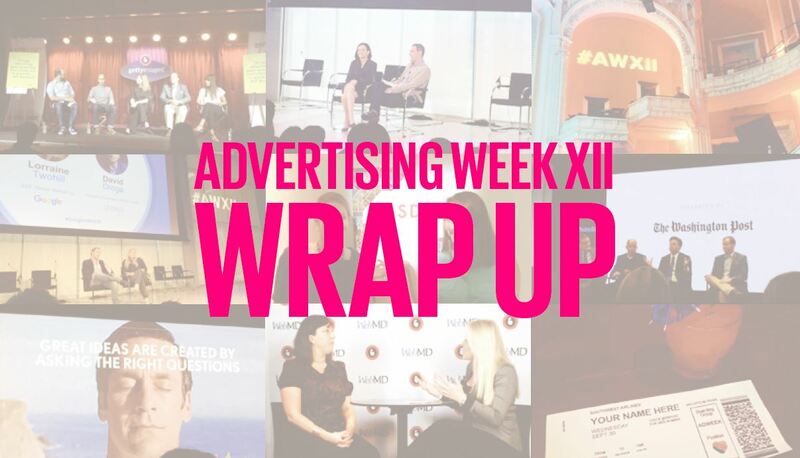 After Day 1 of Advertising Week, DGC pulled together our top picks from the first sessions of the week. Check back here each morning for some of our favorite content from the day before. Enjoy Day 2 – it’s already off to a great start!